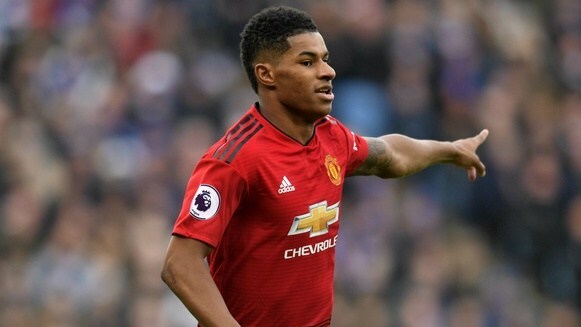 Marcus Rashford marked his 100th Premier League appearance with the only goal as Manchester United beat Leicester City 1-0 on Sunday. The victory put United to within two points of Chelsea, who are fourth on the league table. Arsenal who met Manchester City later are now sixth on the table. Rashford, the England striker finished clinically from Paul Pogba’s pass to earn United an eighth win in nine league games under caretaker manager Ole Gunnar Solskjaer. Their winning run had been halted by Burnley on Tuesday, when the Red Devils fought back from 2-0 down to claim a dramatic 2-2 draw, but the three points rarely looked in much doubt after Rashford’s 10th top-flight goal of the season. Rashford somehow headed over from barely two yards out within the first five minutes, but he soon made amends, controlling Pogba’s lofted pass expertly and drilling beyond Kasper Schmeichel. United eased off after taking the lead and invited some Leicester pressure, although a wayward header from Jonny Evans and a dipping Pereira strike were the best openings they could muster before the break. David de Gea was given a tougher test on the hour mark, reacting well to stop Jamie Vardy’s half-volley from crossing the line after he spilled the initial attempt, and Solskjaer promptly introduced Anthony Martial for the ineffective Alexis Sanchez in a bid to spark some life into his side. De Gea was called on again to keep out Rachid Ghezzal’s dipping free-kick, while Evans swiped at thin air after being teed up by Harry Maguire, but United held firm for a 17th victory in their last 21 meetings with the Foxes in all competitions. Solskjaer’s side were compelled to respond when Chelsea dispatched Huddersfield Town 5-0 on Saturday, and beating Leicester means they are back to within two points of Maurizio Sarri’s side, who sit fourth. With Arsenal a point further back and facing champions Manchester City later on Sunday, this could prove an important result for United in their quest for a top-four finish. Leicester, who held leaders Liverpool to a 1-1 draw at Anfield last time out, are 11th in the standings, six points adrift of the top seven. United head to Fulham next Saturday, while Leicester’s tough run continues with a trip to Wembley to face Tottenham a day later.